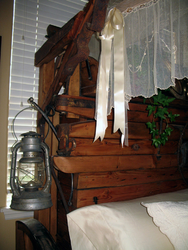 This Bed was created by Mike for his wife Lou Ann for their Honeymoon Bed. 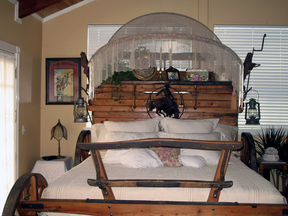 This bed was made from the parts of several 100 year old wagons. Antique Lace is then draped over the bows to create the right romantic feeling fit for a honeymoon. 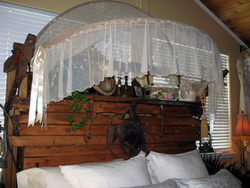 The canopy, which Mike calls 'The Bonnet,' starts with two bows added to the headboard of an old covered wagon. The hero gets the girl. It IS the West!